MELANIE PHILLIPS: CONFUSED JEWS AND ISLAMOFAUXBIA PHOBIA…… – The Tundra Tabloids……. 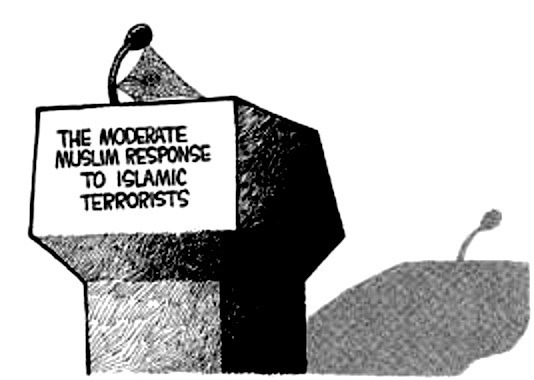 Islamophobia Ruse Melanie Phillips Moderate? I wonder if we had such a hard time distinguishing between hardline Nazis and moderate ones? My focus has always been on the Islam 101’ers and the silent majority who allow the former to get away with their agenda. It really is a vicious circle though, the supposed moderates claim the high moral ground while failing to exactly detail where that justification comes from. That they choose not to exclusively adhere to the post-hijra portion of the koran, does absolutely nothing to negate that portion (which conveniently supersedes pre-hijra portion) which contains most of the violence and intolerance. We point this out, and we are immediately blamed for lumping all Muslims into the same category of radicals and extremists, when in fact, they have done that themselves. Noting the obvious shouldn’t make the bearer of these highly obvious bad tidings, the guilty party. I have great respect for Melanie Phillips, I do however reject my (and others) disgust with outward signs of the sharia (anti-kafir/infidel jurisprudence), as signs of prejudice against Muslims. Unfortunately, she (Melanie) does not come out and detail exactly what ‘prejudice’ against Muslims she is referring to, because the (very ambiguous) just mentioned has been used by HnH as a supposed de facto sign of prejudice towards Muslims, which I totally reject as having any kind of validity whatsoever. The great struggle against radical Islam is being complicated in the West by a phobia of Islamophobia. Of course, prejudice against Muslims should be condemned. But the accusation of Islamophobia confuses prejudice with legitimate criticism of Islam and concerns about Islamic extremism. Outrageously, the document links neo-Nazi and fascist groups with Middle East scholars such as Dr. Daniel Pipes and even with courageous Muslim reformers such as Dr.Zuhdi Jasser, president of the American Islamic Forum for Democracy, and stellar counter- jihadists such as the Somalian campaigner Ayaan Hirsi Ali. A number of these counter-jihadists already live under a permanent Islamist threat to their lives. Yet, astoundingly, HnH accuses them of spreading anti-Muslim hatred. I, too, am included in this grotesque list, even though I have repeatedly acknowledged the many millions of Muslims who are neither extreme nor violent and emphasized that the Islamist perspective is merely one interpretation of Islam. Moreover, I am described as a “supporter of Israel” – as if it is axiomatic that Israel supporters will be Muslim-bashers. NOTE: I too am included on their stupid list, which I claim as a badge of honor, and only in years to come when the maroons and buffoons of this age are long gone, with more clearer thinking individuals parsing through all the BS leveled at those of us in the Counter-Jihad (defenders of classical Western liberalism) will we be exonerated, and buffoons like those at HnH, relegated to the ash heap of history. Previous Post Previous Post AFGHANISTAN WORST PLACE FOR A WOMAN……..
Next Post Next Post TURKEY: EDITOR OF HURRIYET PAPER GIVEN FIVE YEARS FOR INSULTING ERDOGAN…….